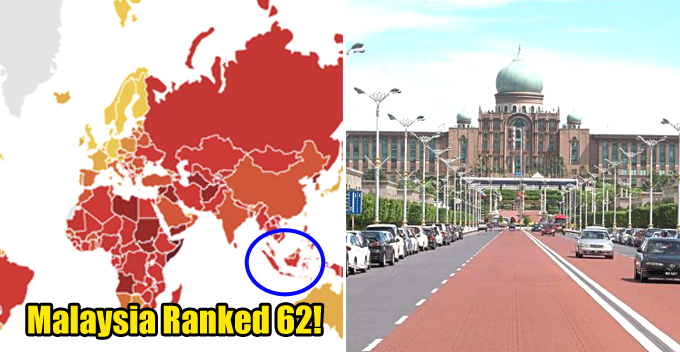 Badminton is one of the only few sports that Malaysians can truly be proud of, which is why when two professional badminton players were found guilty of rigging several games, Malaysians were enraged. In case you’ve missed it, Zulfadli Zulkifli and Tan Chun Seang were earlier suspended by the Badminton World Federation (BWF) for 20 years and 15 years respectively. They were also slapped on with a fine of RM98,338 and RM59,000 respectively for game-fixing in several tournaments. Their hearing was set in Singapore on 26 and 27 February 2018 and the official report stated that the duo were found guilty of fixing six matches, including the Grand Prix in London, Korea, Macau, US, Brazil, and the Netherlands. 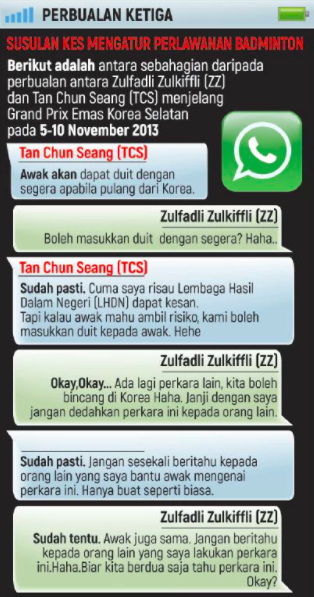 This disgraceful act was exposed when BWF received a complaint from an anonymous shuttler who claimed that they were contacted by Zulfadli to ‘arrange’ the match during the 2016 Brazil Open Grand Prix. Acting on the tip off, BWF set up a panel led by James Kitching to look into this case. They’ve hired a company specialising in extracting forensic data from smartphones and retrieved a series of conversations between the duo. 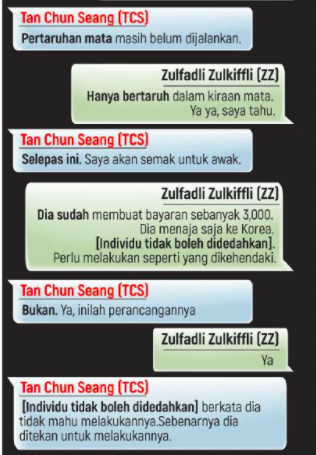 Another company was then hired to translate the conversation from Malay language to English for investigation purposes. The duo was seen discussing about the payment and promised each other to keep things between themselves. 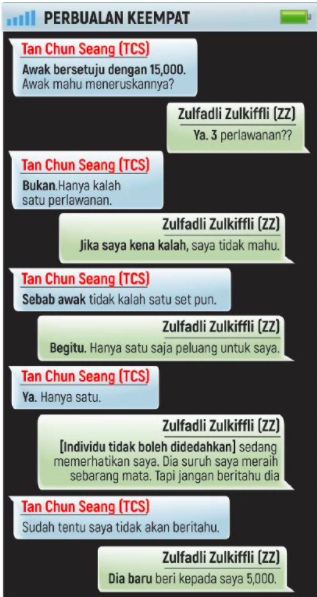 Here are some screenshots of the conversations. 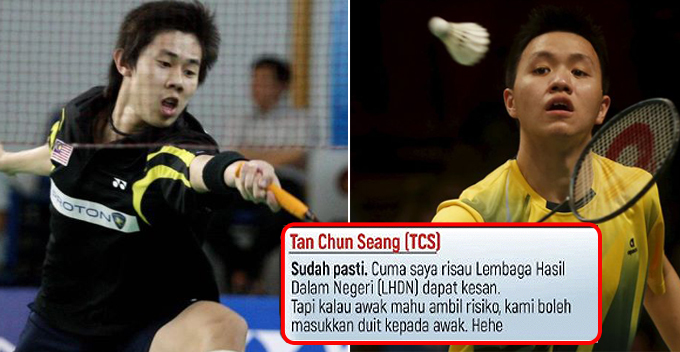 It was understood that both shuttlers are not affiliated with the Badminton Association of Malaysia (BAM) but Tan was part of Malaysia’s team in the 2010 Thomas Cup. Meanwhile, Zulfadli won the World Junior Championships after beating the defending champion Viktor Axelsen of Denmark. This punishment may very well put the duo’s career to an end as they have to wait for 15 to 20 years before they are able to play again. Let’s hope that our other athletes will steer clear from corruption; there’s already enough of it in our country.